These Crisps were a bit of an anomaly in the Crisps and Chips world. They mulched up like dried leaves stomped on by work boots. They crumbled as softer, thinner Crisps might, but the crunch was sharp and brittle. So, although the thickly cut Crisps did not shatter or splinter, but they did provide an excellent munch. These Crisps were highly characterful. They were bendy and curly, as you would expect from batch fried Crisps. There were hardened oil blisters. There was some skin visible on edges, but not as much as we expected. The surface of the Crisps all enjoyed a heavy coating of an orangish coloured seasoning. 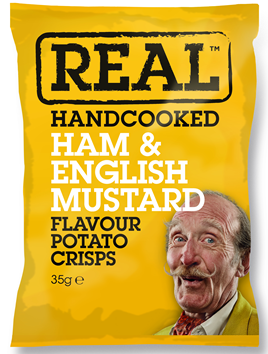 A Nose Plunge Test was not required for these Crisps because as soon as the bag was opened the Ham smell erupted. The flavour had a certain sweetness to it, but the Ham and Mustard combination was fairly evenly matched and distributed, which is always rewarding in a flavour partnership. This however meant that although the flavour of the Ham was brought out by the condiment, the Mustard was not as sharp or strong as we might have expected of 'English' Mustard.